Klim gloves fit more like American branded gloves than European branded gloves (which run a bit smaller). If you have experience with brands like FirstGear, Tour Master, Joe Rocket etc, I think you’ll find the fit comparable. If you have no previous experience with glove sizing, go here for help. Just an observation… I think the fingers of these gloves fit a bit more slender than the average glove, so this with average or slender hands will probably like them more than those with thick hands. If you find yourself between sizes, I’d advise choosing the larger. Here’s a closeout group we picked up from Klim on the Mojave glove! It’s a lightweight summer style that could work for off-road or on the street. The styling is sharp and these gloves will be very handy to use and store away. The entire back of the hand on this glove is flow through mesh material so the wind will blow right through. It’s stretchy and form-fitting too, so getting a size to fit is easy. Across the back of the hand is a molded rubber knuckle protection piece, which is thin and flexible. The palm side of the glove is a man-made suede which will wear well and give good grip. The graphic design you see on the palm is actually a bonded rubber material that improves the grip. The cuff closes with a Velcro tab and there is an integrated pull tab to help you get them on. The material used in the palm will operate your tech, so no need to pull the gloves off for that. These gloves compare very favorably to off-road styles. And we do sell a lot of light, simple styles like this to people who use them on the street as well (even though they don’t have robust armor features). 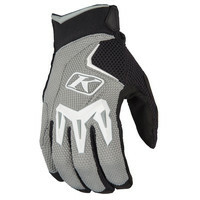 Klim says: The Mojave Glove integrates perfectly into the KLIM Mojave Series offering high volume ventilation while delivering a perfect balance of comfort and durability. Designed specifically for outstanding comfort in the hottest environments.